Bucks Beautiful - Times Publishing Newspapers, Inc. Bucks Beautiful is a local grass roots 501(c)3 nonprofit organization that coordinates events, community projects, educational programs and partners with like-minded community organizations to develop sustainable landscapes that are not only attractive but will support and foster a healthier environment. Since 1990 we have worked to enhance the local landscape for residents and visitors alike by beautifying towns, schools, parks, roadsides and pathways throughout Bucks County. In 2018, Bucks Beautiful began our new initiative, RePlant Bucks, to lead the way in facilitating the reforestation of local communities. Due to the recent hazardous effects of disease and insects on the tree canopy, entire stands of dead trees have been cut down. 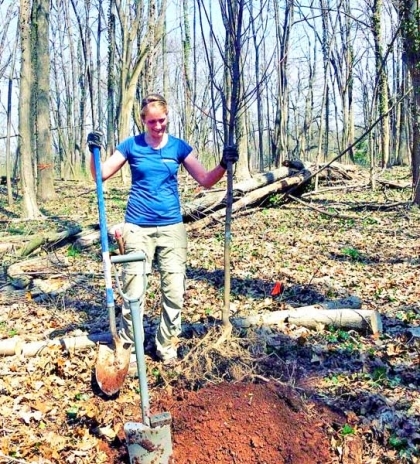 With support from community donations RePlant Bucks was able to plant 1,000 native trees at local parks, historical sites and schools in the first year of the program. Donations are welcome to help reach the goal of planting 10,000 trees for future generations. Bucks Beautiful has partnered with the Henry Schmieder Arboretum at Delaware Valley University to present Spring and Fall series of educational lectures led by regionally renowned gardening experts. Speakers and topics can be found on the Bucks Beautiful website. Enjoy the beautiful daffodil display during the springtime bloom season. Bucks Beautiful has planted more than 1,400,000 daffodil bulbs in public areas. Enjoy a special evening dining in country elegance at the 2019 Spring Fling held at the historic Inn at Barley Sheaf Farm. All proceeds from the evening’s wine pull, live and silent auctions benefit community beautification programs. Join Bucks Beautiful in celebrating the 25th Anniversary of the Annual Kitchen & Garden Tour. This year’s walking tour showcases an exciting mix of properties, allowing the public to see Bucks County’s finest kitchens and gardens in Doylestown Borough. Funds raised from the tour go towards community garden grants, horticultural scholarships and educational programs. Bucks Beautiful has a new series of handmade Deneen Pottery mugs. The new colorful mugs are a series of five with floral designs that represent programs and events we support. Mugs can be purchased on our website and are sold by the piece or set of five. To donate, purchase mugs or for further information on our programs, contact Bucks Beautiful at 85 E. State Street, Doylestown by calling 215-340-3639, or visit www.bucksbeautiful.org. PHOTO CAP: Local landscapers help Bucks Beautiful’s RePlant Bucks program plant 1,000 native trees in Bucks County.